It’s an expensive time to be a LEGO fan, or a cheap time depending on your point of view. 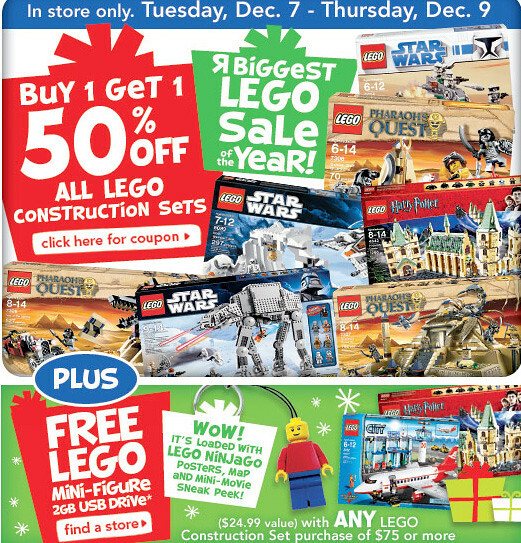 Toys R US is running another Buy 1 Get 1 50% off sale tomorrow through Thursday with a coupon here in the US. THIS TIME, however, it applies to ever LEGO set from what I can tell (see your participating Toys R Us for details), although I make no promises. That’s a break – typically at least a few lines, especially the licensed lines (Harry Potter, Star Wars) plus the newer lines (Pharaoh’s Quest, etc.) are excluded in these sales. If you don’t have that email, make sure and get on Toys R Us’ mailing list. There are also a few other promotions, as you can see from the email above. In store only. One coupon per guest. Regular pricing applies if purchase requirement not met. Not valid with any other “R”Us offer for same item or on prior purchases. Discounted item must be of equal or lesser value to the lowest priced item purchased.